This quick salad makes for a perfect partner to a pasta dinner. Cook bacon in small saucepan until crisp. Drain bacon, reserving 1 Tbsp. of the drippings in saucepan. Add dressing to reserved drippings; mix well. 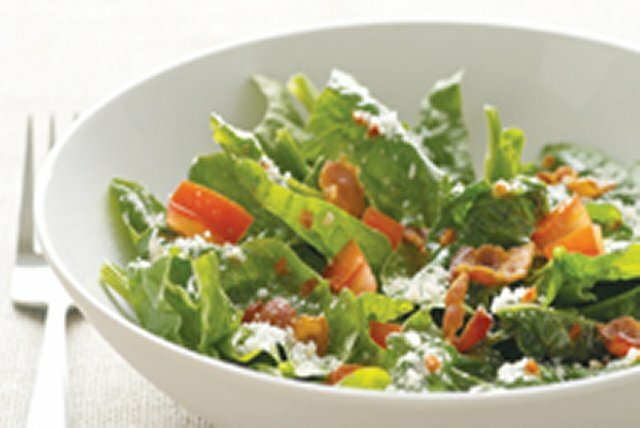 Toss spinach with the bacon and tomatoes in large bowl. Add dressing mixture and cheese just before serving; mix lightly. Fill a large bowl with water, then swish spinach around in water until most of the dirt comes off. Repeat process two or three times, using clean water each time, until no more dirt clings to the spinach. Rinse thoroughly under running water and remove hard stems. Spin dry in salad spinner and/or pat dry with paper towels. Use immediately or store clean dry spinach between layers of dry paper towels, if desired, in perforated plastic bag or loosely wrapped in a plastic bag in the refrigerator for up to four days.